target had frozen whole turkey breasts on sale for $.99 — i thought that was a pretty good deal! definitely cheaper than chicken and pork and beef, so i bought one! when bumpkin and i were talking about what we’re going to cook this week – i mentioned i had that turkey breast in the freezer and was planning on using it! bumpkin said she’d get one too — so it was decided — we’d be cooking a turkey breast! i found this recipe on allrecipes always a good place to look! The turkey breast came out super moist! i didnt get alot of the cranberry/onion/orange flavor — but maybe the part of the turkey that was at the bottom with all the liquid will have more of that flavor! 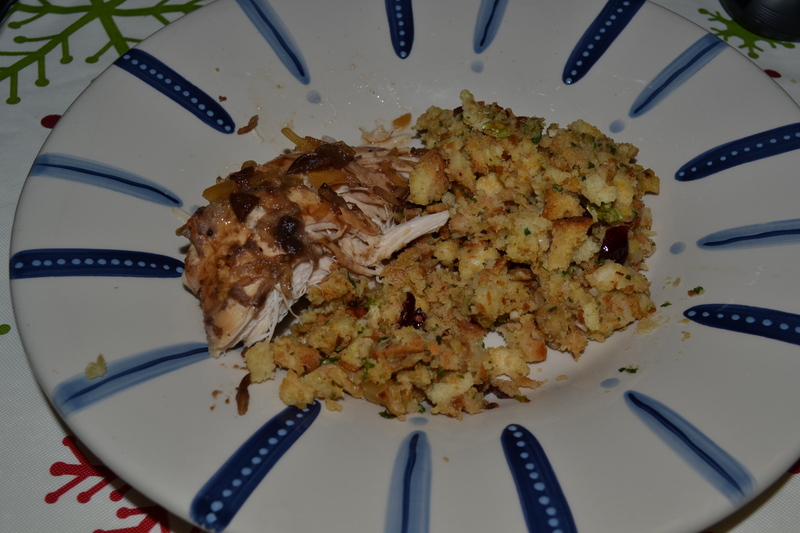 i served it with stove top in which i mixed in some toasted walnuts and dried cranberries. i didn’t have orange juice, but i did have some frozen concentrate – so i mixed up some of that! Place the cranberry sauce in a bowl, and mash. Mix in the onion soup mix and orange juice together until the mixture is well combined. Spray the inside of a slow cooker with cooking spray (i use the reynolds liners), and place the turkey breast into the cooker. Pour the sauce ingredients over the turkey breast. Set the cooker on high, and cook until the turkey breast is very tender, about 4 hours.